Born from humble background made him struggle for survival. 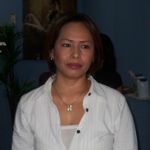 Siwa Max Wekan was born in Tanimbal, a small island in southwest Maluku, on the 14th of March, 1960, from a large family. From such humble beginnings, Pak Max tried to keep the faith with his life. He joined the army in Maluku where he stayed until 1996. While in the Army he was offered many opportunities, but he preferred to stay in the Army and going wander around the tropical jungles. 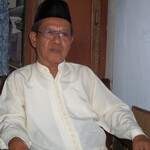 In 1985 he moved to Jakarta, and since 1988 he moved to Jalan Jaksa where he has been to the present. He also started a carrier being involved in activities as a member different organizations, but he has a special interest in Fisheries. Pak Max appears at the first glance to be a rather unfriendly person, but in fact he's very friendly and very welcoming. Pak Max is a very well known figure in Jalan Jaksa, even among some foreign tourists who come here. Pak Max is an active member of a variety of interesting community organizations, including Forum Betawi Rempug (FBR, Betawi Community Forum) where he is a very senior official of this group. He is also chairman of Barisan Muda Demokrat Garda Nasional Indonesia (National Democratic Party Youth Front), and chairman of Pembela Hak-Hak Rakyat Kecil (Defenders of the Rights of the Little People). Even though he's an important person, including for many people in the government, Pak Max lives in a very simple house and is very much respected by the people of Jaksa. He says he is dedicated to the people he protects, and lives by the creed 'Lebih baik mandi darah di lapangan untuk membela masyarakat dari pada gagal dalam tugas atau kepercayaan' (Better to be drenched in blood on the battlefield than fail to accomplish the task or responsibility). Pak Max will do anything for the people who need him and his team, and he's always ready any time, anywhere. Stylish and relaxed, Ade often shows his care to others without asking anything in return. Growing up in a well-educated family, Ade parents come from Padang, Sumatra, and Italy. He has an adverturous spirit of the wanderer and is deeply curious, which is perhaps why this man born in Jakarta on the 30th of March, 1977, keeps travelling to so many places. Being born and raised in Jalan Jaksa, this man who the popular name 'Gondrong' knows much about Jalan Jaksa. Ade Gondrong is one of the young people of Jalan Jaksa. He works to gain money, one of the all his works is as a guide for foreign tourists. Underwent the life by the all the way it is made him calm and confidence. Begun with the great curiosity made him have had the background of the hard life, likes; became a busker in serious place and did criminal action/fighting. He also married and be divorced in young age with a child. But of the all happened made him to more understanding a meaning of the life. Failed in building the household it doesn't mean that he was completely broken, he resolved to finish his study (S1) from a private university in Jakarta and worked in a private Bank in Jakarta for three months. Although his worked was suitable with his educational background but he didn't felt the patience and spirit towards his work. For a guy who prefer to work outdoor, working in a Bank is not perfect place for him, so he resigned from the Bank and started to find a new life. From wonderers and experiences that he got, made him to become more mature and wise in taking the decision and trying to take wisdom from each incident. His performance and also his face is often glanced many talent seeker. No wonder many film producers often asked him to become an artist, but he refused it because he prefer as a painter and adventurer, from a painting and adventure he could get special satisfaction in his life. So where ever Ade go, he will be back to Jalan Jaksa, because Jalan Jaksa is his soul and patience and in Jalan Jaksa he can still get socialized and sharing with the all experiences to his friends. He thinks Jalan Jaksa is the best place for he and his son to lived in. Pak Ilyas is one of the oldest long-term residents of Jalan Jaksa, being born and raised in this street. When he was young, he was a musician with a band and was also active in organizations. He has an interest in making souvenirs. He was born into a large 14-person family on the 28th June 1943. After graduating from senior high school, he worked along with his father making souvenirs, something he has continued doing to the present. Pak Ilyas and his family have even made souvenirs for foreign official guests visiting Indonesia, and even now his work is still was used by the Presidential household. Apart of his activity of making souvenir, he also the manager of the Mushollah Arrahmaniyah, where he can be found from 9am until after dusk prayers. 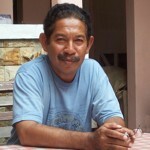 Pak Ilyas is a friendly person who likes to tell stories about happenings in Jalan Jaksa. The thing he likes best is spending time in his mushollah. He was born with the name Surya Djaya, but everyone calls him Acung. He has been in Jalan Jaksa since 1960 till the present, and is very well known in the area. 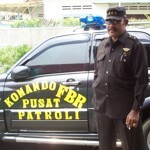 Pak Acung was born 57 year's ago, and is married with three children. He works as a self-employed upholstery repairman in Jalan Jaksa, every day going to his spot along the side of the street where he has his 'workshop' at 9am, and finishing at 10pm. He then returns to his family in Kebayoran, South Jakarta. Pak Acung is a quiet, pleasant person, and he doesn't talk much. His only activity is repairing upholstery, and in his spare time playing football. Pak Acung has been a mute witness to many happenings in Jalan Jaksa over many, many years, but he doesn't care too much about it, because the most important thing in his life is making money for his family. Halomoan Tambunan is the person who made the Margot Hotel the well-known placed it is today. 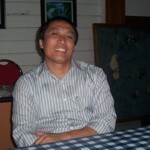 After graduating in economic management at Christian Indonesian University in 1994, he worked at Margot Hotel as supervisor in 1994 until 1998. He became operational manager in 1998. Actually, Pak Lomo has had a reasonably comfortable life, coming from a relatively well-off family, even though Pak Lomo is the eighth from eleven children. Nevertheless, he keeps trying to get the best for himself and his family. To maintain his position, he says he has to work hard. As a profesional person Pak Lomo tries to give his best for his boss and also to his staff. 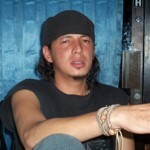 His work not only involves the Margot Group, but he also has to manage a car workshop in Jalan Pramuka, East Jakarta. However, work in Margot Hotel gives a different aspect to his life, and since residing in Jalan Jaksa, Pak Lomo has found certain new things that he himself cannot explain. He believes that in the next ten years, Jalan Jaksa will get even better, not just in terms of commerce but also in its culture and society. At this time Pak Lomo is still single and lives with his sisters in Percetakan Negara, and apart from working Monday to Friday and going to church on Saturday, he likes exercising at the gym or just relaxing at house. 'Life is beautiful' is his creed, and making people happy is the dream of his life. He really hopes to get married sometime in 2006. When her husband died in 1996, she had to cope not only with the loss but also with her six children. She was born in Aceh on the 2nd of September, 1941. Her nick name is tante Ida (aunty Ida), and she used to be a career girl until she married Pak Kadir. She left her job with the Department of Trade and decided develop a rented house with her husband. In 1979, she and her husband built a hotel in Jalan Jaksa, which they called Tator. After her husband's death, she had to manage the hotel by herself, with its ten staff. Tante Ida successfully turned the Tator Hotel into one of the most popular hotels in Jalan Jaksa. In her 64th year, tante Ida still looks fresh with her beaming face. She's a kind women who keeps in touch with the latest trends. This is rarely found in Jakarta nowadays, where a woman in her sixties is still open to the latest lifestyles. Tante Ida's only activity is managing her hotel and building is up as a nice place to stay. Maintaining a hotel in Jalan Jaksa has its ups and downs, and society tends to generalize about the 'negative' aspects of this famous street. But tante Ida just keeps on doing her business, because no matter what society thinks about Jalan Jaksa, it is still a good place to live and to socialize and it already grown to become one of Jakarta's most characteristic places. He has a very relaxed outlook. His parents came from Ambon, but he himself was born and grew up in Jakarta, or to be more precise, in Jalan Jaksa. His full name is Boy Lawalata but everyone just calls him Pak Boy. Born in Jakarta on the 2nd August 1954, the youngest child of three. Young Boy was a really quiet person but he was also an adventurer. He graduated from Trisakti University, and then went to work in the Borobudur Hotel for two years as a waiter, before moving on to become a steward on a tourist boat for two years. The young Pak Boy was a person who became easily bored, and after his stint on the tourist boat, he went to the Netherlands and worked as a guard in a supermarket for a year. But he felt he wasn't getting anywhere there, so he returned to Indonesia. Pak Boy then jumped into his family's hostel business, where he has stayed to this day. Pak Boy is very much a Jaksa old timer. He is chairman of IKJS (Ikatan Usaha Keparawisataan Jalan Jaksa dan Sekitarnya, Jalan Jaksa Tourist Business Association). So, he's certainly a very well known person in this street. Glimpsed with the shining light, Salamah remain stood in Jalan Jaksa and keep on working. For Salamah, selling cell phone voucher is one good deed from her. Since her father's death four years ago, her mother and her six brothers had to stay strong in order to survive living in Jakarta. Because of their financial problems, Salamah decided to quit school and start to help her family by working with her aunty by selling cell phone vouchers. Even though she really wanted to stay at school, she had a stronger desire to help her mother and family. One day, she wants to move her mother out from Jalan Jaksa to a better and safer place; a place where she can be nurtured in her old days. Working in Jalan Jaksa, Salamah equipped her self with good faith and honesty. She has confidence in her heart that one day her life will be better than today. 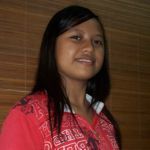 This 14-year-old girl has an incredible persistence along with a humility and calmness in her life. Jalan Jaksa is an unique place that somehow gives growth to a diversity of spirit in people. Jalan Jaksa has its own spell in altering people's destiny. Donna is a person who left behind her principles in the hope that her life would become better. 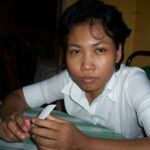 Donna began by leaving her home village and moving to Jakarta, and starting her new life here. Donna has lived in Jakarta since 1997. The first four months she lived in her sister's house but she found it hard to find a decent job. During this time, she became an activist in an influential Islamic political party in Jakarta called Partai Keadilan Sejahtera (Justice Party). When she got her job in Papa's cafe, she realized that being an activist in Partai Keadilan Sejahtera needed seriousness, and she tried to balance her time between working in Papa's Cafe and her activities in the party. It can be seen that her work in Papa's and her activities in her political party are quite different from one another. In the end, trying to do both activities became too much for this girl born in Ngawi on the 24th of May, 1977. She had to choose one or the other. In 2000, Donna left behind her political activities for the sake of improving her own life. By working as a waitress in Papa's cafe, she had to leave behind her Muslim headdress and wear modern, stylish clothes. Working in Papa's Cafe is pleasant work for her. Even though some people say that working in Jalan Jaksa is not good for a nice girl, she doesn't care because the most important thing is getting money for herself and her family. Working in Jalan Jaksa, moreover in a Cafe, she is sometimes pestered by male patrons asking for dates, but she always refuses because she comes to Papa's purely to work. Donna has now worked in Papa's Cafe for seven years, a place well known for its Indian food. Even now, her parents still don't know that Donna works in Jalan Jaksa. For her, work and money are the most important things in her life and by working in Papa's Cafe she has managed to buy a house in her village. Occasionally fate can cause a person's dreams to arise, but more often ambitions remain unachieved. Born 16 years ago, this girl decided to leave school when she felt that her parents could no longer afford to finance her education. Although at first it was very hard for her to leave school -- moreover in her sixth grade she was one of the top three students in her class -- she just had to accept her fate and embrace the rough reality of life. Known as Hanny, she has a talent for music, and can play the violin and guitar as well as singing beautifully. When she was still in school she was in a band that often performed at her friend's birthday parties and also at music festivals, but when her schooling was forced to end, her band fell apart. But that's now history, and now she is trying to forget this and move on with her life. 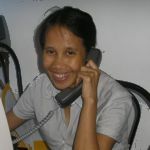 Nowadays she earns a living selling telephone vouchers in Jalan Jaksa, and while she doesn't get much money from this she still manages to keep a smile on her face. She likes working in Jalan Jaksa because she can sometimes get tips from tourists. Her creed is 'work sincerely from the bottom of your heart and hopefully tommorrow will be better'. Born and growing up in Tegal, Central Java, Faria is a woman who is always cheerful and also rather naughty. She spent most of her childhood in Tegal, before continuing her study in Soedirman University where she studied in two faculties, namely; the Livestock Breeding Faculty and the Economic Management Faculty. She finished her studies in the Livestock Breeding Faculty in 1991. After graduating, she moved to Bandung and worked as a secretary at PT. Buying Trading Textile, before in 1993 joining the import-export division of PT. Cipta Sandang Bina Kreasi Garment. 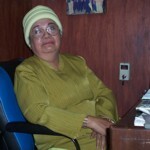 In 1995 she as appointed head of the export-import division at PT. Bintang Karisma Bandung, a CO of Reebok International where she staying until 2002. When she married with foreigner, she decided to resign from PT. Bintang Karisma Bandung and went along with her husband who at that time lived in Yogyakarta. Faria, who was born on June 5th , 37 years ago, mostly spent her time in Yogyakarta and Jakarta helping her husband run his business. But after having a child she also opened a bureau for providing immigration formalities services for foreigners. With humility and calmness in her heart, Faria overcomes all obstacles that come her way with patience and a smile. She always gives her clients her top priority, so it's no wonder this woman has so many clients from various countries. Faria loves reading, swimming and shopping, and has her own idol, her two-year-old son Arjuna. He is the love of her life. Graduating from high school in Medan, she directly got married in 1985 and then went with her husband to Jakarta. In 1999, she started work as a stylist in the Johnny Andrean Salon where she stayed until early 2003. For Laela, who has loved beauty parlors from an early age, having her very own beauty parlor was her passion. She tried to find the right place to realize her dream, but it was really hard to find somewhere that was in a good place but not too expensive. Finally, in 2003, she managed to find a place in Central Jakarta; namely, in Jalan Jaksa. But even though she found the right place, she still had to confront many challenges in opening her business. One of the main constraints was money, but she was determined to realize her dream of having her own beauty parlor. Now 40-years old, she still looks fresh and trendy. She says that keeping healthy is most important for a beauty salon worker. She has a plan to open s new branch in Cibubur. She gives her first priority to providing satisfying service to her customers, because she hopes one day to make her salon as big and famous as Johnny Andrean, her previous employer.